My Vacation Lady has been getting a lot of requests to Bali for 2015 honeymoons— more so than in other years. Bali is one of our most requested honeymoon destinations for 2015. So what is it about Bali that is making it so popular among honeymooners? Where is Bali and how do you get there? Bali’s location is not terribly easy to describe to most Americans. It is part of the Indonesian archipelago and is one of 17,500 islands. It is in the Republic of Indonesia and it is 8 degrees south of the Equator. The Java Sea is to the North and the Indian Ocean is the South. Bali is located north of Australia, south of Malaysia, south east of Singapore and south west of Indonesia. Does that help at all? From the United States, there is NO EASY way to get to Bali. Denpasar is the main airport in Bali and it is a 2 1/2 hour flight from Singapore, about 4 1/2 hours from Hong Kong, about 5 1/2 hours to Sydney and about 3 hours to Perth (Australia). From the New York region, it is going to take about 25 hours to get to Bali and usually over 30 (with layover times) to return. You can take Cathay Pacific from JFK to Hong Kong (it’s almost a 16 hour flight) and then fly from Hong Kong to Denpasar. If you leave on Monday (about 1AM-2AM) you’ll arrive the next afternoon about 3pm. If you take Singapore Airlines, you are going through Europe will arrive in Denpasar in the morning hours 2 days later (but still only 25 or so hours of travel time). These flights may be a layover in London or a direct flight through Frankfurt. The flights are long so My Vacation Lady will usually recommend breaking up the flights with a couple of day stay in Hong Kong or Singapore (on the way out or back – or both). When is the best time to honeymoon in Bali? Bali has a tropical monsoon climate. June through September will be the driest time to visit and will have the lowest humidity. November through March can be the wettest, when the West monsoon can bring higher humidity and heavier showers. April through October can have less than half to 1/4 of the rainfall that November – March can bring. The average temperature is pretty steady year found from between the high 60’s to low 90’s, being coolest in the higher elevation regions. It is typically cloudy in Ubud but that hasn’t stopped the fun for any of our honeymooners. 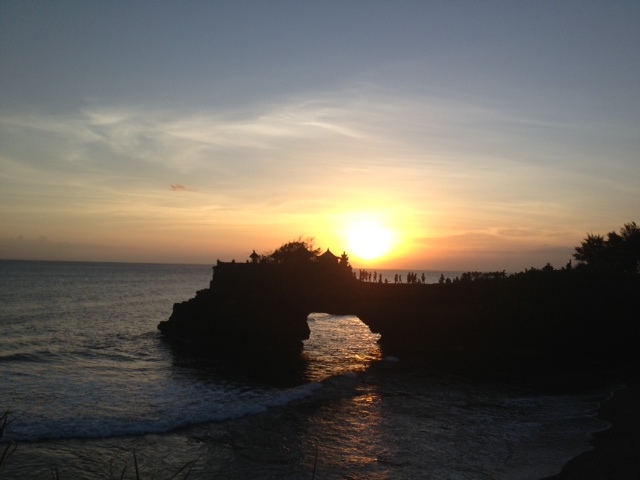 Why is Bali a great honeymoon destination? Because Bali is so far away (for Americans) and is so exotic, this is a destination that is more of a once in a lifetime destination- perfect for honeymoons. Between the stunning beaches, majestic volcanoes and mountains running through the center of the island, the art and culture, coupled with the reasonable prices to stay, eat and explore, Bali is a great destination for honeymooners who want something different. What is there to see and do in Bali? Beach, Culture, Animals and Activities! Bali has it all. 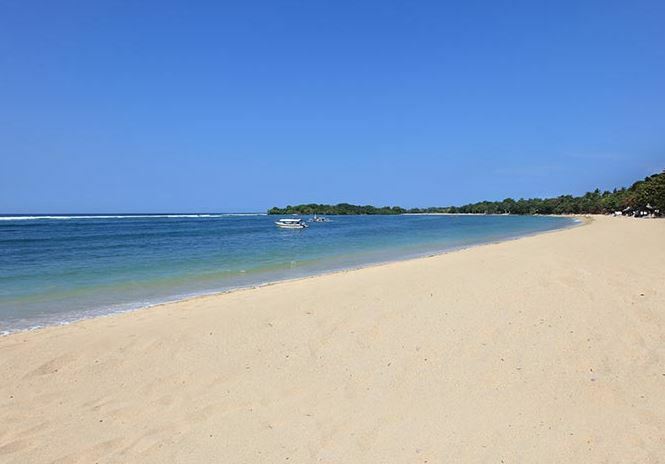 White sand beaches stretch surround Bali and some of the best are in Sanur, Nusa Dua, Seminyak, Jimbaran Bay and Kuta. Top diving and snorkeling sites are among some of the top attractions in Bali. The most popular sites are in the Sanur and Nusa Island areas to the south, in Labuan, Lalang and Menjangan island to the west, Lovina in the north and Amed, Candidasa and Padang Bay to the east. Bali is a surfer’s paradise with perfect waves everyday from Sanur to Kuta and Ulawatu. Animals- from monkeys to elephants to tigers to sea turtles. Adventures from paragliding at Nusa Dua to bicycling in the hills of Ubud or along the beach walk in Sanur, to bungee jumping on Seminyak beach and hiking in the rice fields are some more of the activities you’ll find in Bali. What kind of hotels do they have in Bali? Bali has everything from self catering (apartment type properties) to boutique villas with your own private plunge pools to the deluxe resorts in Nusa Dua and Seminyak to everything in between. The key is to decide how many different places you want to visit in Bali and how long you want to stay at each. In Ubud, there are lots of great boutique villa type resorts overlooking vegetation. In Seminyak and Nusa Dua, you can get beachfront properties and in Jimbaran Bay, how about a resort in the hills overlooking the sea? Dress conservatively if visiting a temple in Bali by covering your shoulders and upper part of your arms, waist and legs. Don’t smoke in public areas, including hotels, restaurants, temples and tourist attractions. Adhere to the red flags on the beaches and if the red flags are raised, don’t attempt to swim. The undercurrent and rip tides can be pretty strong. Bring plenty of sunscreen (you’ll be near the equator) and insect repellent. Bring comfortable clothing (nothing formal is needed) and dress in light, breathable fabrics. Kuta is the Australian’s version of Cancun during Spring Break. Is Bali the right honeymoon destination for you? Bali is not the right destination for those honeymooners with a short amount of time or those who don’t want a long flight. It is best if you have about 10 days to 2 weeks so that you can explore and enjoy all that Bali has to offer. We do recommend splitting your stay between 2-3 different destinations within Bali to get a different feel and prospective and possibly staying in Singapore or Hong Kong to break up the long flight. Aside from the flights, which are very pricey, Bali is a relatively inexpensive destination (as long as you stay away from the luxury resorts) and can fit most honeymoon budgets. What you have to consider is that (based on the time of year) flights from the New York area can run between $1600-2500 per person, which can take a major bite of your honeymoon budget. So if you are looking for exotic, off the beaten trail, some bragging rights and a thoroughly memorable honeymoon experience, Bali might fit the bill. My Vacation Lady conducts a unique and in depth honeymoon consultation with all of our honeymoon couples and we’ll help you figure out if Bali would be the right honeymoon destination for you. Here is a video of what Bali is all about.